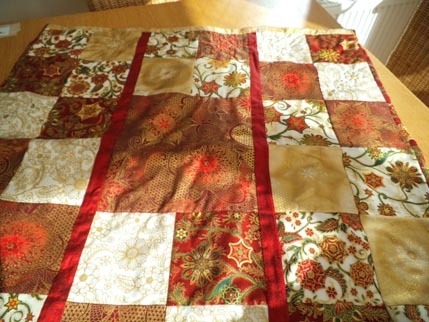 Although I started making quilts to improve my skills at machine sewing I find I do a lot of hand quilting on them which I find very relaxing, especially after a hard day at the chalkface. The current sofa throw WIP is being hand quilted with metallic thread which is always a bit of a challenge to stitch with as it tends to unravel and break a lot but the results are beautiful. 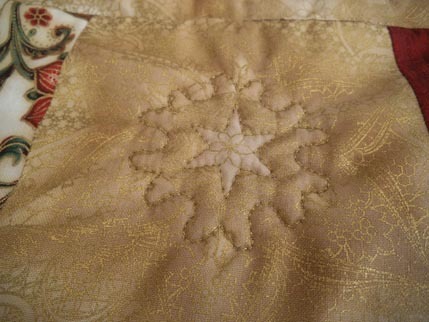 I am hoping that the wonderful fabric and detail given by the hand quilting on this piece will detract the eye from the very inaccurate piecing. You can’t really see it in pic above but the rows do not align well either side of the central panel. At least some of the very out of sync pieces will be hidden on the back of the sofa when it is in place! 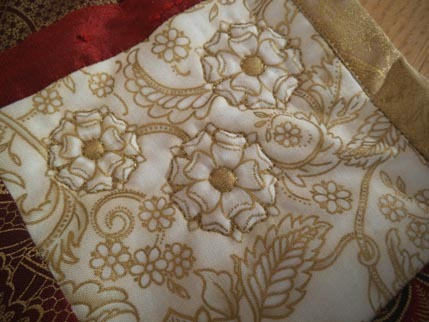 Here are some of the squares in detail, the quilting shows up particularly well on the lighter coloured squares. I am planning to add gold seed beads to the centre of the flowers as well. 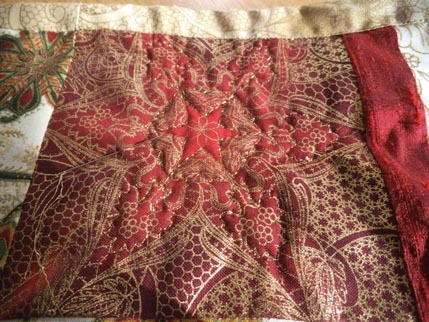 I think most of the fabric is by Robert Kaufman and I know some is called Holiday Flourish which is from their Christmas Collection. As always I wish I had bought lots more of it , I do have a few half metres of some of the patterns but not much. They have some gorgeous fabric in the new collection which is Holiday Flourish 5 – very medieval looking so will be treating myself to some of that at this November’s Knitting and Stitching show. This is a lovely start of autumn project as it keeps my legs warm while I am doing it. I am planning to make a bigger one in plain fabrics for my other patterned and that will be lovely and toasty to quilt over winter! I have a busy weekend planned with house stuff and then the planning for the next term starts. It only seems two minutes since the last group left but I am looking forward to welcoming a new group of lovely trainee teachers. Green door what’s that secret you’re keepin’?